I made this for 3 people so I used. I seasoned this with a splash of Steak Sauce and some Garlic. You can play with this add Sweet Peppers, Zucchini,Mushrooms anything else you love. It is fast and Yummy. Perfect for a weeknight meal. 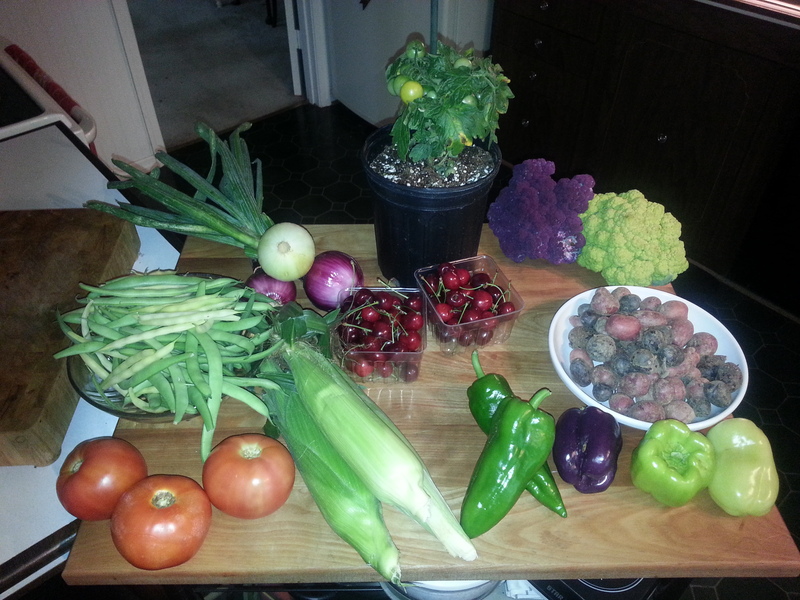 Pictured above: First of the Summer Tomatoes, Italians, Green and Wax Beans, Spring Onions, a Yellow Patio Tomato, Purple and Green Cauliflower, various New Potatoes, Sweet Peppers, Cherries and YEAH finally Corn we can eat. I/We have so missed having Corn. Corn must be Organic/Non-GMO as well as many others Fruits and Vegetables. Check out the Dirty Dozen by utilizing my search button. I will be writing more regarding the importance of purchasing the produce on the list only Organic. Peaches, Peppers and Tomatoes will be coming to your local Farmer’s Market this week. I can’t wait to bite into a fresh Peach and to Grill them. Have you ever had Grilled Fruit? My Guy hasn’t and he is not a Fruit with Savory kinda of Guy. Think I can change his mind? We’ll see ! Til tomorrow……..I’m going to my room. Ok, I think I have……. a new blog…..with some of the old for flavor. Still going to be fine tuning the look. But HEY…it’s definitely moving forward. Thank you for all you wonderful people that kept annoying me and pushing me. It’s been a long and bumpy learning experience. I can’t even tell you how many times I just wanted to be done with having a Blog. I didn’t and now I have an even stronger knowledge of the wonderful world of blogging.